The fourth of my client’s 10 part submission grappling/ground fighting course for martial arts cross training continued the work we began from guard. We warmed up with ground specific movement drills, such as the various crawls and including rolling from the turtle position to guard and back again. We then revised the arm-bar from guard. I then covered a muscle memory exercise to get my client used to attacking with this technique from guard. 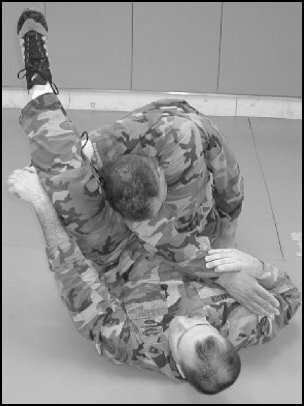 We moved onto the omaplata (aka coil lock or triangular entanglement), a type of shoulder lock from guard. This works as an attack in its own right and also as a contingency move if the arm-bar fails. It is a very strong attack that, if all else fails, can be used to sweep an opponent. We looked at shadowing the technique, so that my client can train it when alone and to reinforce muscle memory. We then moved onto the triangle choke, which is another contingency move, and forms part of the original trilogy of submission moves from guard I learnt during my time studying under Braulio Estima. The lesson finished with some specific sparring, gradually increasing the pressure, and then some frees-sparring on the ground, also known as rolling.